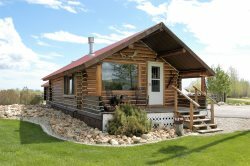 "Consistently excellent Left on Mar 21, 2014 for a stay in Mar 2014 We have rented this cabin for a large group maybe 5 out of the past 8 years and enjoy it every time. The service we have received has been prompt and helpful. The home is beautiful and situated beautifully atop it all so the view is amazing. We really appreciate having two separate living spaces with the mother-in-law suite on the other side of the garage space. The only complaint I would have is that the driveway and the parking lot are in need of assistance. We come during late winter/early spring so it can get pretty mushy, sloppy, and slippery. And driving in vehicles and turning around might be a challenge with larger vans like we use." Beautiful views- plenty of room! Left on Jan 16, 2014 for a stay in Dec 2013 Our family of 9 adults and 5 children stayed here for a few days of skiing. We were pleasantly surprised to find a great sledding hill in front of the house. We used the hot tub which was great, and the little ones enjoyed riding their scooters in the large heated garage. My husband and I enjoyed coffee in the large comfy chairs in front of the huge windows with a magnificent view of the mountains. We brought a lot of food with us including condiments , which was good because while the kitchen is pretty well stocked, as far as utensils, there was very little in the way of ""extras"". There was coffee and filters and salt and pepper. Having stayed in many rentals such as this, there is usually some sugar, a few basic spices and condiments, and some have much more than that. We did have a lovely stay, and would rent again without hesitation! "A Fantastic Get away! Left on Mar 6, 2014 for a stay in Feb 2014 A beautiful home in a fantastic place. The home layout is wonderful for large crowds with lots of different areas for people to go to for quiet time and a wonderful area for everyone to spend time together. This home has everything you could ever want and more! The rental managers are wonderful to work with as well. I would highly recommend this place!" wonderful surprise Left on Aug 29, 2013 for a stay in Aug 2013 When we arrived the property was clean and ready to be occupied. I don't believe the pictures online do justice compared to the real beauty of this location. The main level was the most valuable to us as it had such a wide open area that could seat numerous people comfortably and allow all of us to be together. We all also enjoyed the surrounding area from the mountain roads to downtown Red Lodge. I would recommend this property to anyone looking to spend quality time with one another in an extremely comfortable environment (inside and out- I must mention the deck was well used by us all). Everything we were looking for! Left on Aug 4, 2013 for a stay in Jul 2013 This home is beautiful! The views don't get better than this. Very friendly for all age levels. Great spacious floor plan!